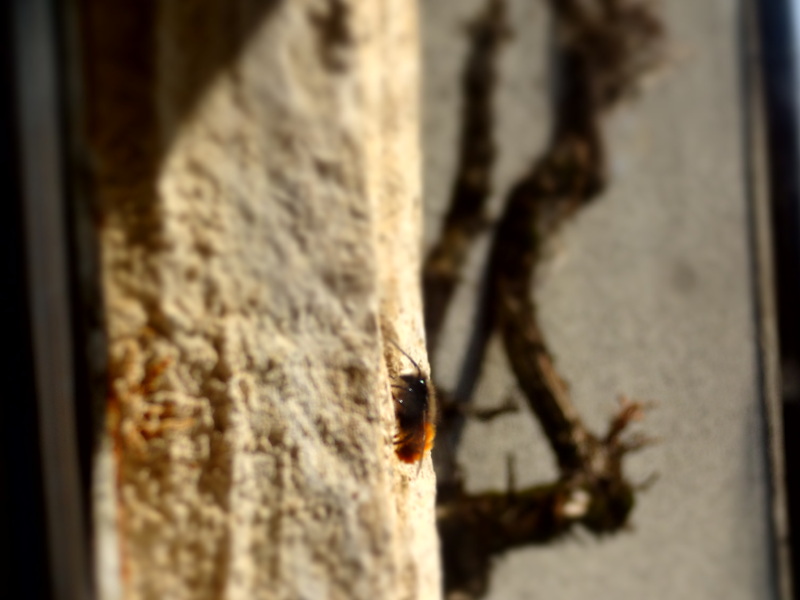 The season’s first bee – well, the first bee I saw, I’m sure there were others – landed outside on our house wall a last week and dithered there for a few minutes before departing again. Then there were more, bumping clumsily into the window of my office and startling me, or just hovering and making a lot of noise. So today I went to the back of the house and checked the spot in the roof where a colony of bees takes up annual residence. 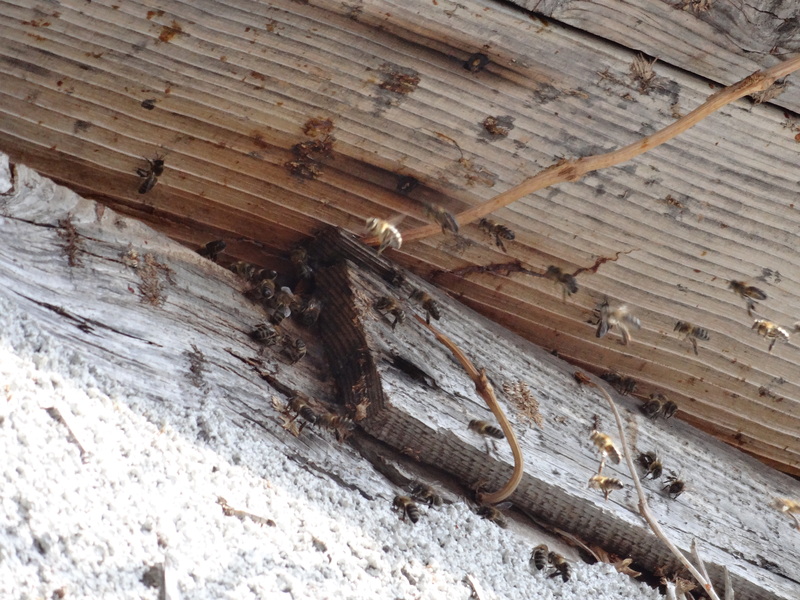 And sure enough, there they were, a small swam of them already busy with work in the upper eave of our house wall. There’s a reassuring regularity to their annual return. It means life is taking its habitual course. The early seeds of springtime, each promising new life: Bees gonna fly, flowers gonna bloom and trees gonna grow. And it’s time to be planting the seeds of the season out in the garden. 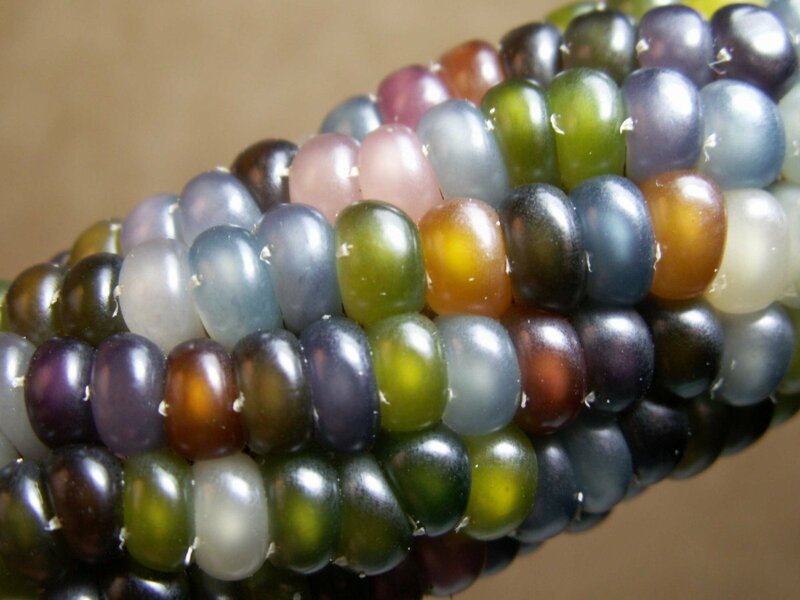 A crazy corn variety, glass-gem corn, a non-GM corn variety. 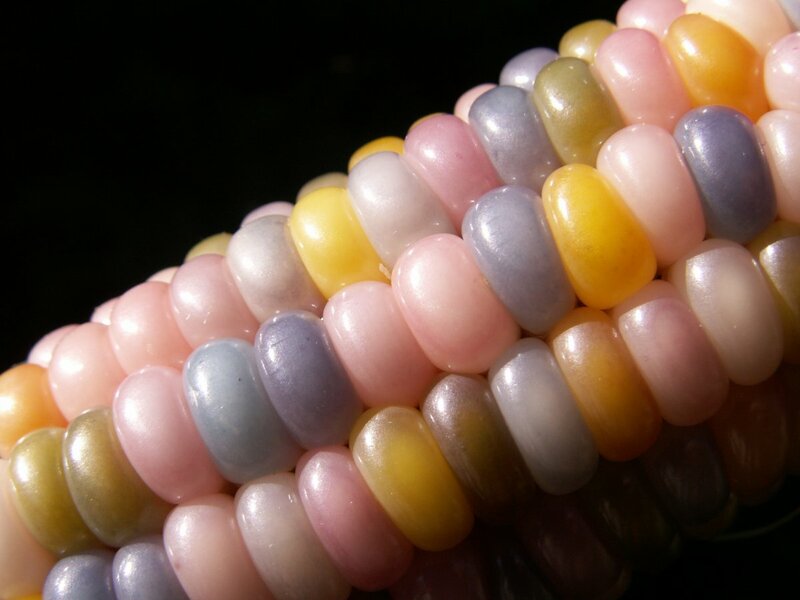 Created using tradition cross-breeding of US native corn varieties. Sometime soon, the Brazilian parliament is going to be voting on whether seeds will continue to follow the age-old cycle of containing the life of a new spring. A bill to allow the use of sterile seeds has been in the pipeline since 2007, and is due for an imminent vote after being postponed late last year due to protests. So-called Terminator seeds, or ‘gene-use restriction technology’, has banned around the world for its inherent danger and, dare I say, its inherent immorality. The genetically-modified seeds are programmed to die off after a single crop, which is to say, each crop is its own complete and finished cycle. Each new crop requires a new purchase from the seed company. It’s not that most farmers don’t already buy their seeds from companies already, and it’s not that farmers and gardeners like myself haven’t been buying seeds from companies for the past century or more. And there are well-publicized conflicts when farmers replant patented seeds without paying the licensing fee – i.e. keeping back a seed stock from the previous year’s harvest for replanting. Still, the GM crops have an infuriating habit of spreading beyond their planting parameters and mixing with non-GM crops. The proponents of the gene-use restriction technology in Brazil say the sterile plants would be for non-food crops only, and would be used only for medicinal plants and the fast-growing eucalyptus trees that feed the paper-making industry. But once a ban has been broken, it’s been broken. Even if the uses are meant to be limited, non-food, and ‘beneficial to humanity’, as Eduardo Sciarra, Social Democratic party leader in the Brazilian Congress, has said. A handful of seed companies control 60% of all seed patents around the world. Many farmers, large and small, are already dependent on seed companies and the narrow range of seed crops they supply. A loss of biodiversity and monoculture as well as economic dependency often result. Seed companies like Monsanto and Syngenta hold patents on gene-use restriction technology, but have pledged not to implement these patents. If the door were to be opened, however, how long could each company resist the tug of economic activity? Adding the option of sterile seeds to this could initiate a disastrous cascade, the antithesis of the annual cycle of life heralded by the bee outside my window. I encourage you to take a moment and join me in signing a petition to remind the Brazilian parliament of its responsibility, not just to its own people and environment, but to ours as well.